The inconvenient truth to Atheism is David Attenborough’s conclusion: Humans are [a] plague on Earth. The law of (un)intended consequences of this kind of thinking says old people should hurry up and die (Taro Aso, Japan’s deputy prime minister), not to mention Roe v. Wade. Humans are not viewed as made in the image of God (Genesis 1:26-27; Genesis 9:6). Man as enhanced animals precludes human rights simply because the survival of the fittest rules, and if the survival of weak people relies on large numbers, then the largest group will overcome the weak who are alone and outcast. No one wants to admit this, of course, but the reality is, no one has a right to life if others deem them inferior and unwanted. It is illegal to take the life of the unborn if the mother wants the baby, but it is legal to take the life of the unborn if she doesn’t. In the first case the law treats the fetus as a human with rights; in the second case the law treats the fetus as non-human with no rights. Humanness is defined by the desire of the strong. Might makes right. We reject this right to define personhood in the case of Nazi anti-Semitism, Confederate race-based slavery, and Soviet Gulags. 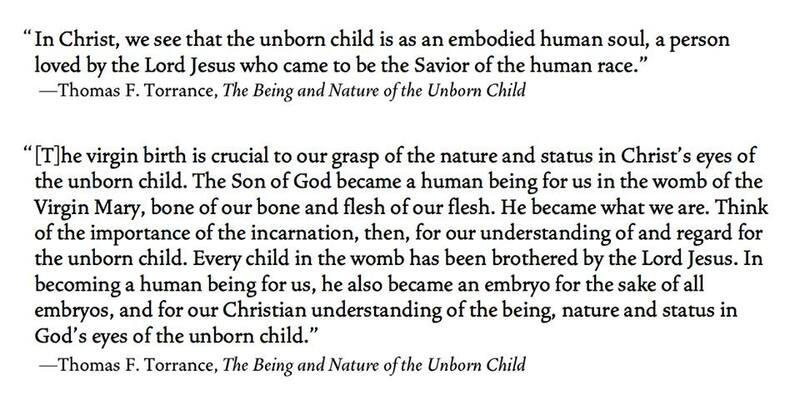 When we define the humanness of the unborn by the will of the powerful we know what we are doing. From the moment when the sperm makes contact with the oocyte, under conditions we have come to understand and describe as normal, all subsequent development to birth of a living newborn is a fait accompli. That is to say, after that initial contact of spermatozoon and oocyte there is no subsequent moment or stage which is held in arbitration or abeyance by the mother, or the embryo or fetus. Nor is a second contribution, a signal or trigger, needed from the male in order to continue and complete development to birth. Human development is a continuum in which so-called stages overlap and blend one into another. Indeed, all of life is contained within a time continuum. Thus, the beginning of a new life is exacted by the beginning of fertilization, the reproductive event which is the essence of life. Herein lies the importance of distinguishing between the science of developmental biology and the science of Human Embryology. Within the science of Human Embryology, the continuum of life is more fully appreciated. The fact that development and developmental principles do not cease with birth becomes more fully realized. So, the continuum of human development does not cease until death, whenever that may occur, in utero or at 100 years of age. In other words, We know what an apple really is. Here we have the core of the pro-choice argument: You are not a human person if I don’t want you to be. And I have the power to make it so. The pro-choice regime has nothing deeper, nothing more rational, nothing more humane. That’s the whole argument. I don’t want you to be a person. How did Psalm 102 change Rosaria Butterfield‘s mind about abortion?